Last Tuesday, I presented a workshop called "Reading Strategies and the Common Core". (I'll be doing it again at KSRA in October if you are interested in seeing it.) We had a great conversation about how reading strategy instruction fits in with the content standards of the Common Core. Key Ideas and Details, 1: Read closely to determine what the text says explicitly and to make logical inferences from it; cite specific textual evidence when writing or speaking to support conclusions drawn from text. Visualizing is a kind of inferring. When readers visualize, they fill in missing details with their own background knowledge. It can be fun to talk with readers about how they visualized a sentence or paragraph, and find out which words or phrases led them to create the pictures they built. The assessment page below can help you to see how readers are (or are not) making inferences as they read. Key Ideas and Details, 3: Analyze how and why individuals, events, and ideas develop and interact over the course of a text. At first, it may be hard to see how visualizing fits in here. But this standard requires readers to track ideas within a text. Tracking requires mental energy! The concentration and stamina that students build from trying to create mental images from text will help them to track more abstract ideas later. On a more concrete level, visualizing events from a text helps readers to understand and process what happens. Craft and Structure, 4: Interpret words and phrases as they are used in a text, including determining technical, connotative, and figurative meanings, and analyze how specific word choices shape meaning or tone. As teachers begin teaching figurative language, often they focus on the identification--Can you find a simile? A metaphor? But the new standards point heavily toward interpretation. What does this simile mean? How does the author develop an idea by comparing these items? What is the author trying to tell us with this personification? As you can see, visualizing is one reading strategy that will still be important to readers as we transition to the Common Core. Update August 2014: Here are some additional Visualizing Resources from my TpT store. What a week! On Tuesday, I presented a workshop related to the Common Core standards for reading; on Friday, I'm presenting an outdoor workshop focused on science standards. Here are the resources that we'll be talking about at Friday's workshop--in between hiking and checking out all of the great locations for science instruction. Curriculum Framework: Use this page to find the specific standards for each grade level. Environmental Literacy Plan Draft: Follow the link on this page to learn about Pennsylvania's environmental literacy plan. You can also sign up for the newsletters on the right side of the screen. Stream Study Practice Samples: At this site, kids can practice assessing the health of a stream with sample stream data. For a more hands-on activity, I photocopied pictures of different macroinvertebrates and glued them to the bottom of paper "rocks". Then, I arranged various combinations of these "rocks" on large blue paper, and gave each group a different sample stream. Pennsylvania Geological Survey: Very detailed information about Pennsylvania's geology. Narrows Stream Bank Stabilization Project: This document shows how stream banks along the Conewago in the Narrows were restored through an EPA project. This would be a good reading selection. Geology of Adams County: A nice map showing the different formations in Adams County. Pennsylvania Groundwater areas of concern: This easy article includes the fruit belt as an area of concern for groundwater resources. It would be an interesting text for students to consider in a study of groundwater. Watershed Alliance of Adams County: A great source for information on local projects and watershed efforts. Thanks for everyone who attended the workshops about the Common Core today! Maybe it wasn't the most fun way to spend a summer day, but it gave us the opportunity to talk about some important new concepts and ideas that will be having a big impact on our reading instruction. Hearing different perspectives on the standards and the suggestions helped everyone to see how this will affect instruction across the grade levels. We started out by talking about how the Common Core relates to reading strategies. It requires a bit of shifting of priorities, but we saw that there are some nice relationships between various standards and reading strategies. In the afternoon, we explored close reading in depth. Using some of the exemplar lessons and videos, we talked about how close reading can fit into our classrooms. At the end of the workshop, teachers used a variety of texts to build a close reading experience for their students. Here are some of the resources that we used throughout the day, as well as some additional thoughts on the matter. The Common Core website includes the standards. Download Appendix A and B for more details on text complexity. The Pennsylvania Common Core resources page includes eligible content, text exemplars, and student writing samples. Institute for Learning blog post about background knowledge and the Common Core. Our group had a lively discussion about the importance of background knowledge and how we should build it in our classrooms. This document outlines suggestions for publishers, many of which are useful for classroom teachers as they create and plan lessons on their own. This article includes links to NYT articles with various text structures. Interestingly, many big names in literacy weigh in on the topic in the comments section. In the workshop, we used close reading methods and text dependent questions to look at Thomas Newkirk's essay "The Text Itself". To find out more about slow reading, check out this book. In my last post, I wrote about the master word list that I recently finished. It's been great to hear from everyone and send the word lists out! 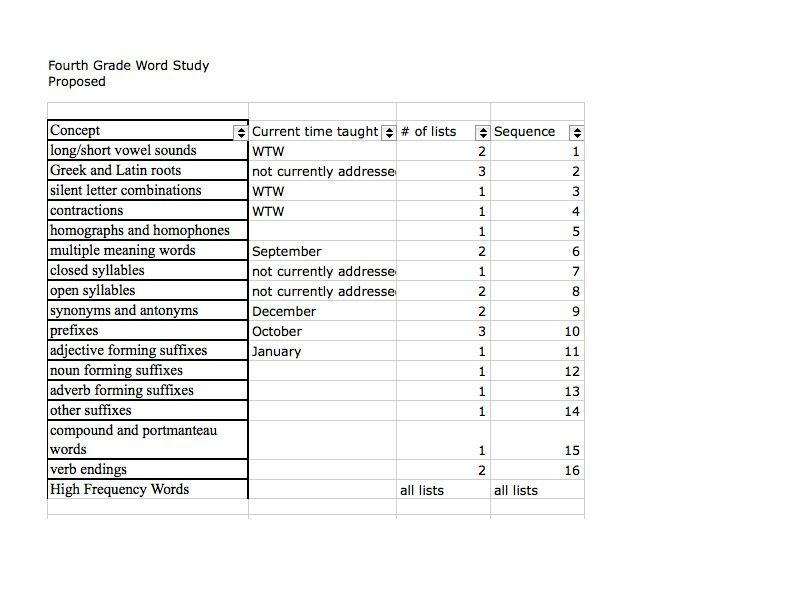 For my own purposes, it has been useful to have an alphabetized and searchable list of frequently used academic words. In an intervention group, I've been experimenting with making Powerpoints to teach academic words. I like to think of Powerpoints as an expandable memory port for myself. I can come up with kid-friendly definitions, pictures, and questions ahead of time. Then, during the hectic 25 minutes of the intervention time, we can all focus on the words together. I get extra mileage out of the Powerpoints by working through them three times with the students. 1. Explain the word and its use beyond the context of the text. Have students use the word in sentences that they tell to one another. 2. Have students find the word in the text and read the sentence with the word. 3. Have students use the word to explain the text, going beyond what is "right there" in the text. The only way to identify your flower, then, would be to consult a flower book. When I introduced this word, we talked about how students can consult resources in and out of the classroom. Students talked with their partners to answer these questions. What resource would you consult to find the spelling of a word? Have you ever consulted the phone book? This moves quickly, with all of the students sharing with their partners at once. One key is to accept only sentences in which students use the target word. And they are remarkably resistant to do so! "I looked in the phone book to find the number of a pizza place," one girl said. Notice how she was using the meaning of the word, but had replaced it with synonyms. I always counter back--"Can you say that again, using our word?" As a last resort, I'll restate what the student said--"You said that you consulted the phone book to find the number of a pizza place. Can you say the whole thing for me?" After we've talked about the words in a real-life context, we go into the text to find the word and discuss its use. Visualizing is helpful here. Many academic words are somewhat abstract and difficult to visualize. So what would consulting a flower book look like? While it's obvious to the adult reader, it's a thinking task for kids. Finally, we use the target words to extend the meaning of the text. 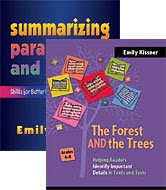 Kids with reading problems often have trouble paraphrasing ideas. Teaching them how to use these academic words to paraphrase and extend helps them to "unfreeze" ideas and put them into their own words. In the case of consult, this word can be used to sum up the entire point of the article: "People used to have to consult difficult flower books, but now they can use field guides to identify flowers." Now, my students didn't just come up with this sentence on their own. Instead, I said, "Can you explain the main problem in the article, using the word consult?" Again, everyone does this, and everyone shares with partners. Did it work? Well, I started to hear some of the words creeping into their talk. Sometimes it was tongue-in-cheek, like when one kid said to his partner, "Wait, wait, wait! I need to consult with Mrs. Kissner about something." But sometimes the use was for academic purposes, such as when a student used the word complex, from a previous article, to make a prediction for the next one. I'm working on putting the articles and the Powerpoints together into a teacher-friendly (and research-based, and inexpensive) intervention. For now, I'm still sending copies of the Excel master word list. Feel free to write if you'd like one! So where to begin? We looked at some of the commercial programs, but none of them had what we wanted. I developed the half-crazy idea to make our own. It's not so crazy, I guess--I've made a spelling program before. This time, though, I wanted to make something that had a firm foundation. Our first step was to figure out what we wanted to teach over the course of the year. We used multiple sources to build this. Our first stop was the Fountas and Pinnell Continuum of Literacy Learning. We looked at what was listed for our grade level and matched it to what we were currently teaching. Then, we put these skills up against the Common Core. We thought about how many lists each topic requires, and how many lists we can comfortably teach in one school year. We put it all together on Excel and created a rough outline. The Excel filter feature allowed us to rearrange topics until we had an order that we all could agree to. Once they were all entered, I created multiple columns to use to filter them. This was the time consuming part! As you can see from the screenshot, there are several ways to generate lists. You can sort the words by syllable or by root. If you are looking for compound words, you can filter a list of compound words only. You can also filter by phonogram, multiple meaning words, or digraphs. I have spent many, many hours looking up word roots and considering phonograms! To save space on the spreadsheet, I combined some categories, such as myth link/diphthong. Did the list work? I felt like Dr. Frankenstein on Thursday when we sat down to try to generate some lists. I was thrilled when we were able to make it work! We now have the words for about 15 of our spelling lists chosen. Of course, fourth grade will not do all 1800 words on the master list. 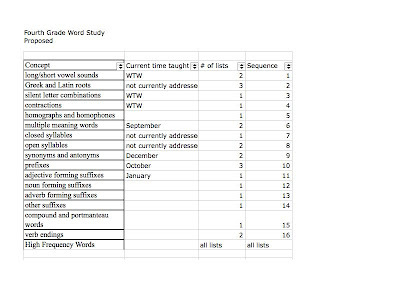 But other grade levels will be able to use the same master list to help them select the words that fit the concepts they have chosen to teach. We are using a tiered list system, just like the Differentiated Spelling Program that I already made. The tiered lists are a great way to meet the needs of different kids while still having coherent instruction. For example, when we do Greek and Latin roots, everyone will study Greek and Latin roots. The struggling spellers will focus on words with simple spelling patterns, like graph and erupt, while the stronger spellers will have more challenging words. Each week, students will take a pretest to determine which tier they will be studying. But the best part about it is that the words will all be important, useful words that are likely to come up in their reading. When we teach silent letter combinations, for examples, we'll include insight from the Academic Word List, as well as thought and though from the Fry List. I'm still working some bugs out of the Master Word List and double-checking for internal consistency (quite a task with 1,806 words). If you'd like a copy, write me an email at elkissn@yahoo.com. Let me know what you plan to do with it (non-commercial and non-profit uses only, please!). And maybe you could leave a comment or follow the blog? After we say our final goodbyes to students next week, my team is coming right back to school to work on some curriculum writing. We have to make some updates for the Common Core and examine our common assessments. Seeing our curriculum map evolve has been an interesting experience. We started the process in the 2008-2009 school year, which feels like an educational lifetime ago. Of the 5 of us who worked on the original order of units, only 2 of us are still in fourth grade. It's great to work with our new colleagues to examine what we've done through new eyes. Why did we choose this order and not that one? Is there a better way to arrange things? Sometimes we have a good answer to these questions. For example, story elements are a great topic for early in the year. As students read independently in the rest of the school year, they can find natural review and reinforcement of these concepts. But sometimes even the 2 of us who worked on the original order can't remember why we chose to arrange something in a particular way. As I've tinkered with things here and there, I have learned that there is no one right way to order units. It's like a butterfly effect of curriculum. I might think that one topic fits better in October, after we have studied x, y, and z. But then it displaces something else, and makes many small changes over the course of the rest of the year. I am generally a random and chaotic person myself, so I don't mind these small changes. But I've learned to work with people who do mind these changes, and (hopefully!) I've become more sensitive to their desires for an orderly arrangement of topics. Is this a good match for the developmental level of our students? Over the course of the year, fourth graders become capable of higher levels of abstract thought. Theme is a great example of this. We teach theme briefly as part of the story elements unit at the beginning of the year. At the end of the year, we look at theme in more depth, as part of a "Going Deeper into Fiction" unit. Some students who did not understand theme clearly in September just fly with the concept in April. As you think about your content, try to consider what would be a stretch for students, and what you'd like to front-load at the beginning of the year. Are there connections that we can make to other content areas? In science class, we learn about the skill of "classifying" as part of our introduction to inquiry unit. It just makes sense to classify texts at this time, looking at the differences between narrative, expository, poetic, and persuasive text. This helps them to see how this idea of classifying cuts across content areas and is a huge skill for all areas. Will this be a building block for other topics? The skill of making inferences has been one that we have played around with a lot. Where do we put it? On the one hand, we want to teach it early in the year, so that we can refer back to it frequently. On the other hand, we want to have plenty of time to practice inferring, and spending three weeks on making inferences early in the year displaces other topics. We've compromised by putting an introduction/review of inferencing as part of our introductory unit, and then adding a longer examination of inferencing later in the year. What do students need to know for testing? Our state testing is in March. We know that there are some topics that we must cover before the test. As my husband says, it's like trying to fit 10 pounds of sugar into a 5 pound bag. So many things to teach, and so little time! Our big units have evolved under these general headings. This is not to say that they are exceptionally brilliant, or that I wouldn't redo them all given the chance. (That's the random and chaotic side of me speaking.) But they are something that we have all agreed upon, and that we have all collected resources and texts to teach. I know that it is becoming fashionable again to teach thematically. If I had an unlimited budget, it's what I might choose. On a tight budget, though, it's exceedingly difficult to amass enough texts to maintain an entire school year of themes. I am quite choosy about texts, and sometimes I cringe when I see collections of texts that might all reflect a certain theme or topic, but aren't good matches for readers or the standards that are being taught. Because our curriculum map is for 2 different schools, the only theme we could really put together at this time is the Antarctica unit.